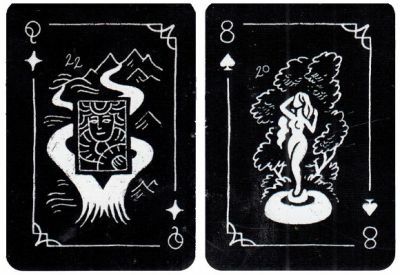 Shelley Barnes, an American designer and illustrator, self published in 2015 a Lenormand oracle pack of cards. This pack has distinguished features. There are 54 small and monochrome cards. The additional cards from 2 to 5 display only the pip signs. The 36 cards are of course numbered but discretely and the figures are still present, stylised and inserted in the middle of the card. From the author, The chalky white drawings convey a classic folk-occult flavour, and their miniature scale makes larger spreads like the grand tableau more manageable. The jokers are as expected the Gentleman and the Lady. This is quite interesting to have a multi-purpose pack of cards. I would have preferred larger cards but I know some collectors like patience cards. Price and where to find: Packs can be bought for US$ 12 from www.shelleybarnes.com. The full set at US$ 22 includes a booklet, a pendulum and a velvet pouch.